NEW YORK (CNN) -- Bank of America's chief executive officer spent four hours Thursday testifying in an investigation into the $3.6 billion in bonuses that Merrill Lynch paid out just before it was acquired by the bank last year, but still refused to give out the details of those payments. 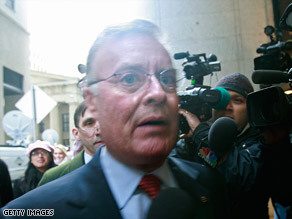 Kenneth Lewis prepares to enter the offices of Attorney General Andrew Cuomo on Thursday in New York City. The New York Attorney General's Office served a subpoena on Bank of America during chief executive Kenneth Lewis' testimony Thursday evening, seeking the full list of individual bonus recipients at Merrill Lynch, according to Benjamin M. Lawsky, a special assistant to Attorney General Andrew Cuomo. "We obviously wanted to question Mr. Lewis about this list and are very disappointed that Bank of America has chosen not to produce it. As a result, during the testimony this evening, we served a subpoena on Bank of America for the list, which we intend to obtain," Lawsky said in a written statement. Lewis, speaking to reporters as he left the attorney general's office after his testimony, said that he had come to "deliver clarity" and that he answered the questions that were asked to the best of his knowledge, but refused to take any questions about the details of the deposition. Bank of America has been allocated $45 billion of federal bailout funds, and the Treasury has guaranteed to protect Bank of American against potentially billions of dollars in losses from investments Merrill Lynch made in real estate loans. Former Merrill Lynch Chief Executive John Thain told investigators last week that Lewis was aware Merrill employees would be awarded billions of dollars in bonuses before Bank of America's takeover of Merrill became effective January 1, according to sources familiar with the investigation. In testimony before the House Financial Services Committee on February 11, Lewis said he had little involvement in the Merrill bonus plan. "They were a public company until the first of the year, they had a separate board, separate compensation committee and we had no authority to tell them what to do, just urged them what to do," Lewis said. But Cuomo's staff obtained a document, negotiated between Bank of America and Merrill during their takeover negotiations, that set a cap for Merrill Lynch's bonus pool at about $5 billion, said sources with knowledge of the investigation. Bank of America confirmed there was a cap set. Cuomo has accused Merrill Lynch of trying to hide lavish bonus payments. "Merrill Lynch secretly moved up the planned date to allocate bonuses and then richly rewarded their failed executives," Cuomo wrote in a letter to House Financial Services Committee Chairman Rep. Barney Frank, D-Massachusetts. Cuomo found Merrill paid its four top bonus recipients $121 million and doled out bonuses of $1 million or more to 696 employees, as the firm lost $15 billion in the fourth quarter. "I don't want to see the taxpayers being taken advantage of. And I don't want to see the taxpayers paying performance bonuses that shouldn't be paid," Cuomo said. Cuomo is investigating to see whether failure to disclose the bonus payments to investors violated New York's Martin Act, a powerful securities law that empowers the attorney general to bring not only civil but also criminal charges. CNN's Allan Chernoff contributed to this report.